“Go change the world,” words from a friend as I left for Nairobi, Kenya this summer to spend a couple of weeks serving in the slums of Kibera. Little did I realize how much their world would end up changing me. Several people have asked about my time in Kenya―the poverty, the lack of education, and many things they have heard or seen about it. Many are surprised when I respond, “It’s a different world, but it’s their world, and ministry is happening right where they are.” Before I went on this trip, I never expected to meet a group of people who were serving the least of these in such an impactful way. The team at Swahiba Networks is changing the world and impacting God’s kingdom right where they are. Here are five things I learned from them about serving God and truly changing the world. Meet others where they are. 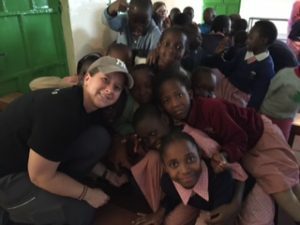 The ministry focus of Swahiba, which means “good friend,” is to minister to those in need in the slums of Kibera with most of their focus on orphans, widows and youth. That is exactly what I experienced while I was there. 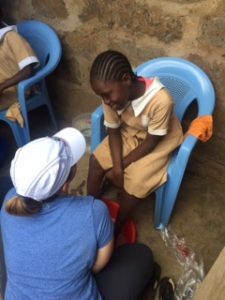 Our days were jam packed with service—giving mattresses to widows and single women, delivering food baskets to families in need, providing new shoes for orphans, and hosting a soccer tournament for high schools in Kibera. I asked the director of Swahiba if they plan these ministry activities just when groups are visiting to help. He responded that they do the same type of ministry every week. I nearly fell over from exhaustion and amazement. Swahiba is meeting the least of these, right where they are in Kibera and truly living out James 1:27. Our strength is not in what we own but in Who owns us. During our time in Kibera, we got to assist in a ministry led by 127 Worldwide that distributes mattresses to those in need. We gave mattresses to women who were widows or left by their husbands. Many had never owned or even slept on a mattress before. They shared their stories with us, which were overwhelming but for those who knew Jesus as their Savior, it was evident their strength and joy comes from the Lord. 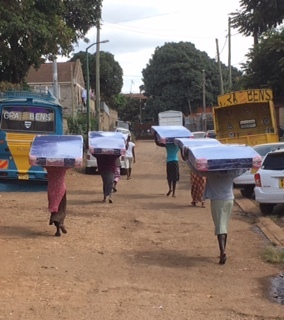 You can see the strength of these women (pictured below) as they carry their new mattresses to their homes and navigate their way through the terrain of the slums. God’s Word will meet every need. Most days we made home visits to families in the slums to deliver food baskets. While at their homes, we would learn about the family and find out how we could pray for them. Our team encouraged them with truth from God’s Word and prayed for them. Every time God would give someone on our team or the Swahiba team the right words from the Bible to speak to them. It was amazing to see their demeanor change, and the hope they had in the truth of His Word. We may not have known what to say, but in the moment God always provided specific verses from His Word to share, showing that the Bible truly is living and active, always working and meeting every need. Learn from the least of these. Probably the most powerful take-away from this trip, as a believer in Christ, is that God can use anyone for His work. Many times during the trip that I was humbled by how God was working in the slums. Some examples include: listening to a high school boy named Bruce encourage his friend to trust God, witnessing a high school girl, Sabina, ask only for prayer to have wisdom and guidance and not wealth or good health, getting to meet Bruce’s mother, Momma Bruce, who makes paper beads and encourages other women at her work to trust God and be a light for Jesus, being welcomed at an orphanage with songs to the Lord and with hugs and smiles, noticing a little boy so thankful for his new shoes that he worked fervently to wipe away with his dirty socks the red dirt that had made them unclean and the smile of gratitude when I wiped away the dirt with a clean cloth. These are a few of the moments I hope to never forget. Be real. Love continually. Never back down. This one is really 3 things, but these are the top things I learned from the staff of Swahiba who faithfully serve the Lord daily. Many of the staff can relate to the people of Kibera, because they have walked or are currently walking in their shoes. But they have hope. Their hope is in Jesus, and they continually love and serve the people of Kibera, because Jesus first loved them. They show His love in everything that they do—serving widows, orphans, youth, and the least of these in the slums, and building relationships so others may know the true love only Jesus can give. Faithfully they serve, never turning from the strength that comes from the Lord, never backing down from the hope that is the love of God. While on a safari, we saw a lioness in a standoff with three water buffalo guarding their herd. 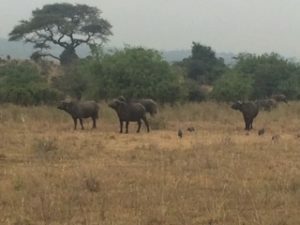 I’m not sure how long the standoff lasted because we drove up on it, but what surprised me was these water buffalo guards ran off the lioness. The water buffalo stood their ground and never backed down, they protected their herd. They would inch a little closer to the lioness but always stood firm in their position. God is using Swahiba Networks to be a firm foundation for His Gospel in Kibera, and inch-by-inch they are serving Him, sharing the love of God, and changing their world right where they are. Praise God! Written by Andi Sloan, a native Texan who currently resides near St. Louis, Missouri, working in the business world and consulting as a Children’s Ministry Specialist at Child Evangelism Fellowship®. She serves as the kindergarten Bible teacher at her local church along with various other ministries. Since the age of 12 Andi has been pursuing Jesus and is passionate about learning and sharing the truth of God’s Word with others, serving in local and world missions, and sports (all of them)! Thank you for all your work and for your beautiful testimony. It is very inspiring and proves how high and how wide and how deep the love of our Lord, Jesus Christ, is! Designed By Fynepix Limited | Impression matters | 2017.